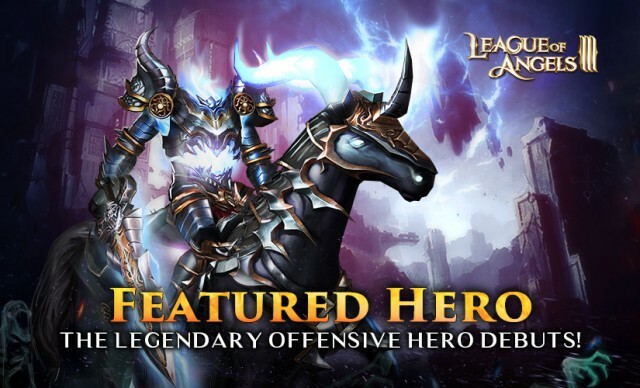 The Five-star Legendary Offensive Hero Debuts in Featured Hero! Following the legendary healer Johanna, League of Angels III is excited to introduce a five-star legendary offensive hero Omen in the latest update. Omen the headless horseman, can not only gain a buff to revive himself after casting his special skill “Brutal Strike”, but also increase his own attack while dealing damage to his enemies. He will be available to all players in Featured Hero from October 31st to November 4th! Team up with this legendary hero and get ready for the spooky Haunting Eve in League of Angels III! The Prince and the betrayer of the Freeman Kingdom, Omen was forced to commit patricide in order to stop his father Freeman IX’s violent behavior during the Warring States. After entrusting the Freeman Kingdom to his uncle, he committed suicide to atone for his crime. His corpse was gifted to Aunisi, afterwards he became a headless knight and commanded the Bone Legion. Omen may not be the first five-star hero in game, but he is the first legendary hero who has a 100% chance to revive after empowering to level 4. With the sword pointed straight ahead, Omen’s Brutal Strike casts immense damage to a row of enemies and deals an additional damage with a critical strike. Apart from the special skill, Omen can also increase his own ATK while punishing enemies. Slaughter: Attacks an enemy target, dealing (ATK *180%+80) damage. Also increase own Critical Rate by 70% for 1 turn. Soul Forge: The horse leaps into the air, and the Headless Horseman stabs the enemy as it lands, dealing (ATK *190% +110) damage. Also increase own ATK by 10% for 2 turns. Brutal Strike: Dashes towards the enemy with the sword pointed straight ahead, dealing (ATK *200% +150) damage to a row of enemies. Deals an additional 20% damage with a critical strike. Level 4 Empower unlocked: Gains a buff after using the Ultimate skill: has a 100% chance to revive with 20% HP if killed within 2 rounds. Can only trigger once per battle. Level 8 Empower unlocked: Gains a buff after using the Ultimate skill: has a 100% chance to revive with 60% HP if killed within 2 rounds. Can only trigger once per battle. This burst damage and debuff hero will make his debut in Featured Hero this Haunting Eve. From Oct. 31st to Nov. 4th, you’ll be able to summon Omen and obtain his shards by opening the Point Chests after accumulating the required points. Seize the chance to take the legendary hero into your squad and augment him to full stars! We hope all players can build an elite squad of theirs and enjoy the Haunting Eve celebration in League of Angels III! Last: League of Angels III As Facebook Featured Game of the Week!